For the bottom-feeders of the stock market, the shares of Pacific Gas & Electric Corp., the parent of California’s biggest utility company, must look very tempting. Falling to a price of about $17 during Friday’s trading on the New York Stock Exchange, the shares have lost two-thirds of their value since mid-October, and three-quarters of their value since reaching a dividend-adjusted peak of nearly $70 on Aug. 31, 2017. PG&E’s market value, which once exceeded $36 billion, now is less than $9 billion. PG&E’s price has been driven down by looming liabilities from its role in massive California wildfires in 2017 and 2018 and the prospect that the company may have to file for bankruptcy. In some respects, PG&E looks like a bargain, because it’s selling at a discount to the presumed value of assets that include its transmission and distribution grids and its hydroelectric generation capacity. The business model of PG&E has proven to be a failure. Investor-owned utilities are unworkable because their incentives are profits, not safety. On the surface, that suggests a solution to California’s perennial problem of what to do about the chronically underperforming PG&E: Since the shares are now trading for a few dimes on the dollar of what they used to be worth, why shouldn’t the state just buy the company? After all, $8 billion isn’t that much, considering that Gov. Gavin Newsom this week proposed a state budget of $209 billion — especially if the price is covered by an issue of tax-exempt bonds. One could throw in the parent of Southern California Edison, which has lost about one-fourth of its value since late 2017 and now carries a market capitalization of only about $20 billion. That point may have been reached with PG&E, and even with Edison. The companies are living counterexamples to the notion that private enterprise is more efficient and competent than government. We can start with two words: San Onofre. That is the multibillion-dollar nuclear plant that Southern California Edison turned into useless scrap through its mismanagement of an equipment refurbishing project. The shuttered plant now casts its shadow over Interstate 5 on the border of Orange and San Diego counties as a monument to corporate incompetence. PG&E’s record outdoes that in almost every particular. The company was convicted in 2017 of six felonies connected to the gas line explosion that took eight lives and leveled the suburban community of San Bruno, Calif., in 2010. Last month, the Public Utilities Commission alleged that the company falsified gas pipeline records for years following the explosion. The utility faces liabilities estimated at more than $30 billion for its possible role in the wildfires of 2017 and 2018, some of which may have been sparked when vegetation came into contact with PG&E electrical lines or transformers. 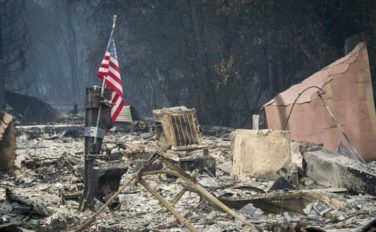 Among those for which the utility may be held responsible is November’s Camp fire, which killed 86 people, destroyed more than 18,000 buildings and incinerated the Northern California town of Paradise. The cause of the Camp fire has not been formally determined by state fire authorities. PG&E also has announced plans to shut down the state’s last operating nuclear plant, Diablo Canyon, by 2025. The bad news on PG&E keeps coming at a torrent. On Thursday, Moody’s Investors Service cut the company’s credit rating to junk status, just days after Standard & Poor’s took the same action. “The company is increasingly reliant on extraordinary intervention by legislators and regulators” that may not come in time to avoid bankruptcy, the ratings firm said. At this stage, discussion of a state takeover of the utilities via the stock market is largely theoretical. The state Constitution forbids the state to own stock in a corporation (though the Constitution can be amended by a supermajority of the Legislature or at the ballot box). Any such expenditure certainly would run into a political buzz saw. The mechanics of a takeover also would be difficult, as the stocks would soar as soon as plans for a state bid became public, diluting or eliminating the current price advantage. And state ownership wouldn’t reduce the burden of the billions of dollars in wildfire liabilities. But the idea is a useful tool for thinking about what changes in the structure and oversight of the utilities are warranted, including state ownership. Those issues are now on the front burner at the PUC. On Dec. 21, commission President Michael Picker issued a memo outlining changes the commission might mandate for PG&E. They include breaking up the company into its gas, electric and transmission pieces; firing the entire corporate management; or reconstituting it as “a publicly owned utility or utilities.” Picker is a former board member of the Sacramento Municipal Utility District, one of the state’s most successful public power agencies. A takeover also would save a mint in executive salaries. PG&E Corp. Chief Executive Geisha Williams pulled down $8.6 million in salary and stock grants in 2017 and Pedro J. Pizarro, CEO of Southern California Edison parent Edison International, collected $9.76 million. By contrast, David Wright, the general manager of the Los Angeles Department of Water and Power, the nation’s largest public utility, received $528,179 in pay and benefits. The utilities’ books and records would be open to public scrutiny, and their policies more aligned with ratepayers’ desires — since the ratepayers also would be voters. That’s a mixed blessing, of course, since ratepayers always want low rates, not necessarily fair rates, but on balance it may be better than ratepayers having no influence. Experts in utility regulation say focusing on government ownership of the companies may be too narrow. Even with its dismal performance record, PG&E still owns a valuable franchise — its license and its extensive gas and electric infrastructure, which could be placed under the control of a new license holder. “The question the PUC and the Legislature should be asking is, who’s out there who can perform the best?” says Scott Hempling, a Maryland-based expert in utility law. There’s also some precedent for an attempted takeover of the transmission network, Freedman points out. During the state energy crisis in 2001, then-Gov. Gray Davis reached a deal for the state to purchase Edison’s transmission assets to keep the company out of bankruptcy. The deal eventually was blown up by Senate President Pro Tem John Burton (D-San Francisco), who considered its terms tantamount to a bailout of Edison. But the network is still a valuable asset. Some of the utility industry’s leading critics are still unsure whether a state takeover is the right move. State ownership is “something that a lot of people are talking about right now,” says Freedman, “and it’s good to get it out there as a concept.” A more interesting idea, he believes, is to take over the pieces of the utility system that are “particularly valuable and have unique public benefits,” such as the transmission networks and hydropower systems. And yet, those utility stock prices sure are tempting at current levels. Someone is going to make a killing, and why shouldn’t the state of California be in the hunt?